After our latest newsletter for Wrapunzel the store was released (Do you receive our weekly Gazette? Click HERE to sign up! ), I decided to write a bit more on the blog about the subject of party wraps. Be sure to keep reading until the end, where I describe the process of choosing a very special tichel for a very special event. Enjoy, ladies! Let’s be real for a moment- it’s only mid-November and I’m already talking about party season? Well… yes… but with good reason! It’s in early November each year that I attend an annual black tie event with my husband (THE black tie event of the year for us, in fact) and the preparation for this always involves careful planning of both my outfits and the scarves that I choose to go with them. Needless to say, party wraps have DEFINITELY been on my mind lately and I love dreaming up ways of making them match distinct styles of dress. Previous years and events of this caliber have seen me wearing all sorts of intricate multi-scarf looks. 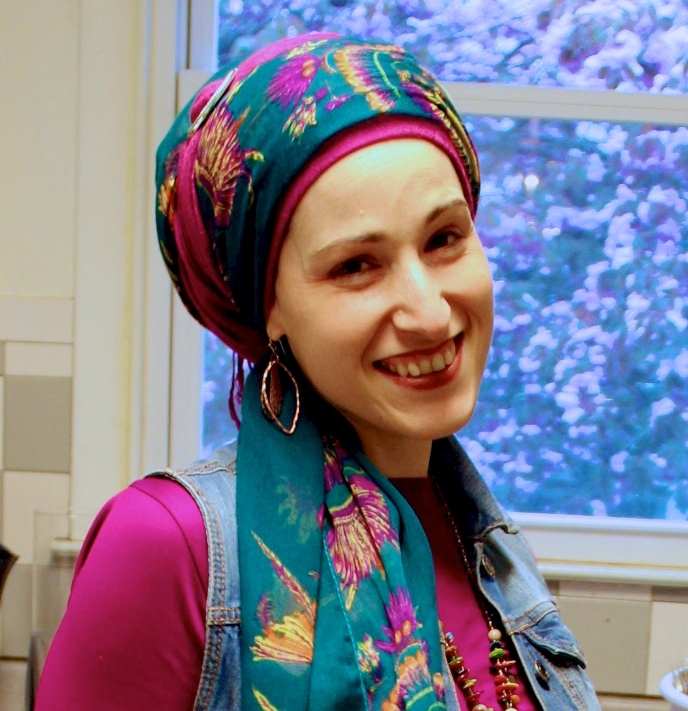 Double turbans, Waterfall Twists, a Tiple Zig-Zag or two… My mind always seems to equate fancy events with extra fancy wraps and it wasn’t until recently that I discovered that just a single scarf could look and feel equally as beautiful. It didn’t garner thoughts of feeling underdressed, as I had feared and there are many ways of making this work, no matter what style of dress you choose! Many of us wind up at fancy affairs during the month of December, so with our calendars filling up and party season creeping ever-so-closer, why not start thinking about styling options now? Whether it’s celebrating the holidays, New Years Eve, or even just seasonally with friends (There are those with birthdays during this time of year, too! ), let’s take a look at matching wraps to your party/fancy/formal dress wear, while letting just one scarf be the focus – complicated multi-scarf styles optional, which is perfect for wrappers of ALL skill levels. Dressing up for parties is fun and can allow us the chance to don many different garments that we wouldn’t normally look at for weekday wear. The same can be said for tichels! Once you know the theme or dress code for the occasion and have found a way to amp-up your personal style- now what? Well, it’s time to choose the perfect scarf and style of wrapping, of course! *Remember that watching tutorials and practicing wrapping styles well before the event is always a good idea- There’s nothing worse than getting dressed and finding yourself tangled in scarves, attempting to wrap in a way you discovered just minutes before! Being prepared will help eliminate stress and give you more time to concentrate on other pre-party preparations. A black Ultimate Wedding Tichel tied over a very light blue 2 in 1. Is your signature party look influenced by a feminine wardrobe? Romantic blouses and skirts, soft pastels, ruffles, laces and silks are commonly found in this woman’s closet. It can be classic and understated or include bold statement pieces, both of which pair perfectly with quite a few wrapping styles! One of the most obvious choices of wraps for this look would be lace and there certainly are plenty of easy ways to wear it. Lace triangular–shaped scarves come in a multitude of colors and are quite possibly the easiest-to-tie tichel of them all. Their sheerness also means that you can easily incorporate another colored base-scarf underneath it, for a multitude of different effects. This is not necessary, though, as there are plenty of women who simply wrap them over a black or white volumizer and call it a day, making them a quick and easy way to wrap for formal occasions. 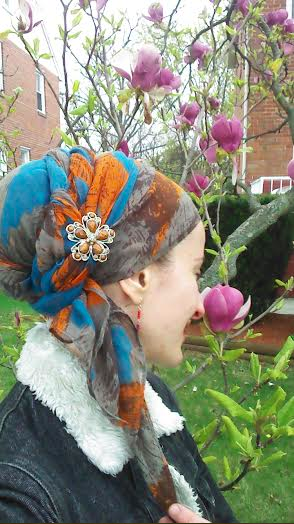 The Ultimate Wedding Tichel (shown here) is new to my wardrobe, but has quickly become my all time favorite feminine scarf. For women who aren’t into lace (like myself), it is an excellent choice! I love how it utilizes sequins without being over the top and its beautiful silky fringe is a level of formality not found in many other tichels. The combination of sheerness, sequines and embroidery lends itself perfectly to a top made of satin or silk (see photo), which will create a party look that’s feminine, yet understated. Turbans can be stunningly glamorous and look amazing at parties of all types! The women who wear them might favor trendy minimalistic outfits or big bold prints, but one thing’s for certain- a turbanista exudes CONFIDENCE where she goes! The most comfortable scarf I’ve ever found for turban-tying is jersey, but it can sometimes be tricky to dress up for parties, particularly when worn solo. 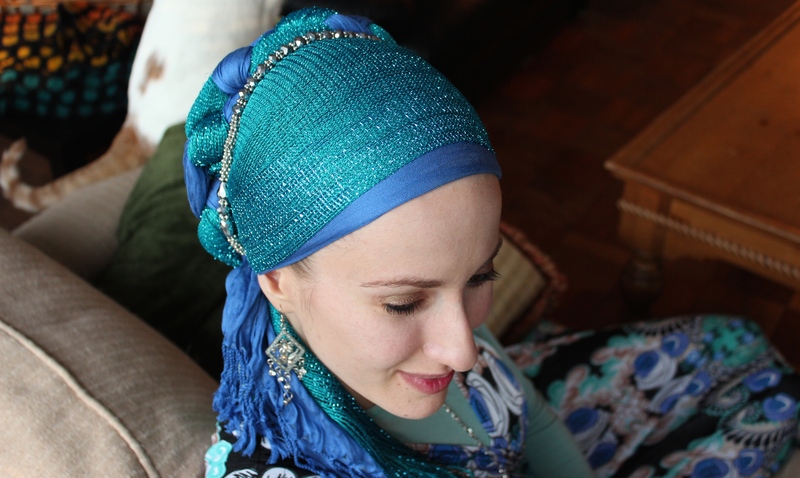 One way to do so is by opting for a glittery version, which is such an easy way to fancify your favorite turban ‘do. 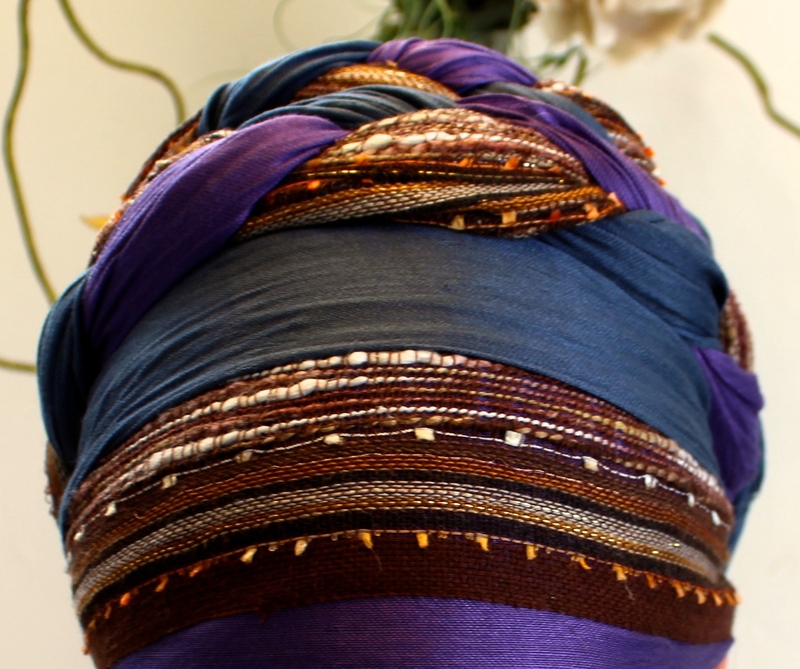 Adding a glitzy pin will also take your beloved turban to the next level. If you’ll be dressing for the most formal of occasions, even more sparkle might be necessary. A one-scarf turban tied with a tichel that has a sheen throughout is an easy way to achieve this, whether you go for one that is soft and flowy or bold and more structured. 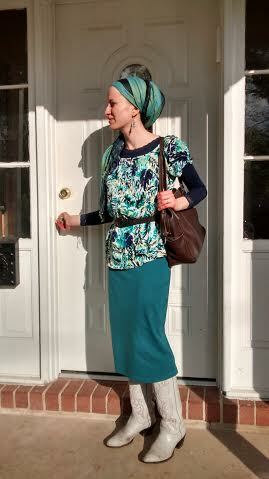 Try matching the color of your turban to your shoes and purse, for a perfectly polished, party-ready look! Patterned scarf (coming soon!) over a navy Shimmery with Infinity Clasp. If most of your outfit is a print- Try a solid-colored wrap: Pick one of the main colors from the print as your scarf color. If most of your outfit is solid- Choose a printed scarf that contains your clothing color within its pattern. Now, I know that I said that this post would be about letting just one scarf shine, but Naomi Rose’s photo here shows an excellent way to wear two scarves, while keeping just one as the focus. Her formal-looking Shimmery makes a wonderful accent to the patterned scarf, which dresses up the wrap subtly, ensuring that the two won’t be competing for attention. A party-ready look, for sure! Belle of the Ball in gold over a red base scarf. This one focuses on how to wear boldly printed pieces in a super matchy-matchy way, with the end result being a stunning look, worthy to be worn at all sorts of parties and events! Both the print and outfit are frequently duotone and focus on both patterns AND texture. Pattern mixing among the scarf and garment can reign supreme, but that’s not to say that solids don’t play a part, as well. I typically start with one eye-catching printed piece (say, either a dress or blouse) and then complete my outfit with one or both of that pattern’s colors throughout. Andrea’s gold Belle of the Ball (shown here) was a perfect match for her outfit! While the shades don’t have to match perfectly (Notice the variation among reds in said photo. ), keeping them within the same family is essential for this look to work. Matching a wrap to a perfectly coordinated party outfit like this will take careful planning to make sure everything is just right, but will also make a BIG impression. The payoff is so, so, SO worth it! Here’s where I get to write a bit about how I chose that very special tichel for a very special event! But first, let’s talk a some about how to pair you wraps with an ultra-glamorous, retro-inspired party look. So, it was keeping with all of that in mind that I began to think about what I would be wearing to this very important black tie event, but the decision was, by no means, an easy one. With a fabulous vintage-inspired dressed picked out months in advance, I had a LONG time to think about what to wear on my head, yet it really wasn’t until about a week prior that I started to give it any serious thought. Despite what I knew about retro turbans and styling, I did find myself considering an exotic multi-scarf style to wear with my gorgeous sequined gown (This, after all, is always an easy way to look formal and there are no “rules” when it comes to wrapping), yet not a single color combination I could think of seemed to jive… not a single two-scarf style seemed to work! I was 99% sure that I wanted to wear The Shimmery, but was not at all sure of much else and was feeling immensely frustrated. A couple days before the big event, my gown had arrived and I was STILL feeling totally blank and without a single shred of inspiration. My frustration was now reaching maddening proportions. In the end, it was my husband who suggested I drop everything I know and start from scratch, reassess all of my usual formal styles and trying something new. Oh, how right he was! You see, once I was able to take a step back and come at it from a different perspective, I realized that the reason my intricate wraps weren’t working was because they were competing far too much with my dress- an easy solution, but one that I wasn’t able to “see” previously. Simple had worked for fashionistas of the past and it was going to work for me, too! The next question was, bright and bold or a classic monochromatic look? While the answer wasn’t immediately clear, I did get a chance to experiment some and try a few scarves on during a photoshoot the day before our event, which was immensely helpful. No matter which one I would ultimately choose, I could go into it knowing how each could be wrapped, lifting part of the indecisiveness off my shoulders and making getting ready before the event a breeze. I had narrowed it down to: The Shimmery in red (Tied in a Turban-style Regal Wrap), The Shimmery in purple (Tied in Shira Tails), Belle of the Ball (Tied on the side with a hair elastic.) and The Shimmery in pewter (Tied in an Extra Fancy Turban with a feather fascinator.). Fast forward to 24 hours later to when the night of our event was imminent, and we were about to walk out the door. The very last thing I had to do was to put on my tichel and it was then that I gave the pile of possible contenders one final look, before deciding to leave the decision up to my wonderful and loving husband. One glance was all it took- he knew exactly which one he would choose! What followed was an awesome evening where I felt like a million bucks and couldn’t have been happier to arrive in my one simple scarf. A little time, a little preparation, a little frustration and a little stepping back, all led to discovering my signature party look (for this event, anyway.) and I hope you all can enjoy the adventure of discovering yours, as well! I’d never tried doing The Naomi Knot with a shimmery scarf before! This just sparkled like nothing else!! And whenever I do this wrap I can’t get over how intricate it looks… the tie is SO easy! I heard that a few of your tried the Naomi knot and didn’t have perfect results; watch the tutorial and make sure that one side is MUCH longer than the other (the shorter ends can be as short as possible) and tie your knots loosely so they go over your head! In this one pictured I actually had tons of scarf left over! Let me know how it goes for you! 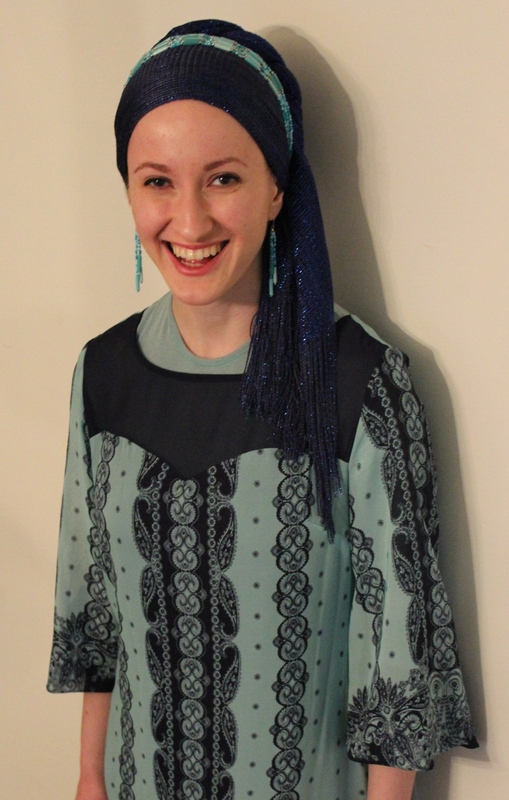 This is one of my favourite outfits that I wore in Israel… the dress allows for so many tichel colour combinations! This 4-strand braid always makes me so happy!! And standing on the hill where my husband and I got married! You can see the wall of the old city behind… such a holy place! In these photos I’m wearing four 2 in 1s – I was out all day in the boiling heat and stayed quite cool! I would, however, if I wanted it to be cooler, choose a style without so much hanging tail on the side… but it was super fun in the breeze! Hi Everyone! I’ve been trying to figure out a way to do the double braid so it doesn’t just sit like a low bun (not flattering on everyone’s face shape), and have figured it out! You just need to wear your shaper/bun much higher, and when braiding, make the braid loose so it’s longer. I suppose you could skip this step if you can find super long scarves, but I prefer using traditional length scarves so wanted to find a way using these! Check it out! I actually rewrapped it after taking these photos and now it’s even higher than this!! Woohoo! It is SUPER hot and humid today in Jerusalem (39 C /102 F)… so I’m wearing a floaty skirt and of course my tichel is off of my neck! Thank Gd, with staying in the shade and drinking lots of ice water I so far haven’t melted! Hi Everyone! So for those of you that have been following the whole Wrapunzel/Wrapunzel The Store saga (“Wrapunzelution” is now a word!!!! ), you will know how incredibly blessed both Rivka Malka and I are to be on this whirlwind adventure! There is a revolution brewing, and you are the ones that are starting it! Incredible! Anyway, here are some tichels and outfits I’ve been putting together lately that have made me feel both modest and regal! Rockin the Rustic Romance… this scarf is still my favourite! It just hugs the head so nicely! And seriously I can’t get enough of these Signature Max pins… they grab so much scarf and lay so flat! Can we all hope together that one day we can get them with gold backing? Another functional outfit that wore beautifully! Hello cowboy boots! Can we just take a moment to appreciate how awesome this woman is?! Seriously… in awe! Enjoy, y’all!! Lately it hasn’t been very often that you’ll see me wearing one scarf… I’d forgotten how beautiful it can be!! Yes, layers are incredible, but sometimes you just want one scarf to shine… and this Navy Shimmery certainly did that beautifully. I added a necklace and that was it! The wrap I did was a waterfall twist (with an extra little twist) and it stayed put all night long with no adjustment needed! 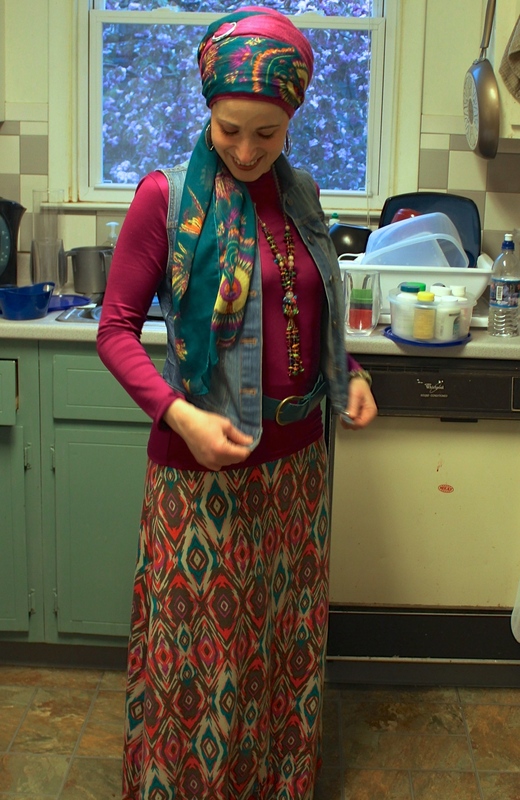 Since I was wearing a black shaper underneath, no other scarves were needed except the one! The outfit I wore was another lucky Goodwill find! I almost didn’t buy it because I thought it would be hard to match, but then remember I had a mint shell and a navy skirt that would work perfectly with it! This was one of those fancy but super comfortable outfits that I know I’ll wear again! I hope you enjoy it! I hope you are all having an inspiring, healthy, cathartic, and grateful weekend! Sending you much love and light!